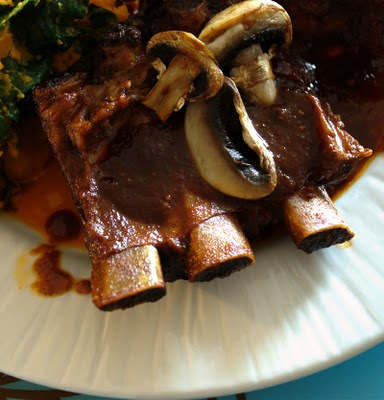 Lately we have been trying different rib recipes. There are so many ways to cook ribs. This time we baked them in a 300 degree oven for 3 1/2 hours in a covered roasting pan. We got the recipe from Michael Smith on the Food Network. The recipe says to bake them for 21/2 hours but cooking them a little longer makes them even more tender. We kept the leftover sauce and used some of it in the next recipe on this blog when we pan roasted apples. We served the ribs with mashed sweet potatoes mixed with spinach.